It’s been almost eight months since the massive 9.0 Tōhoku earthquake hit Japan, leaving devastation in its wake. 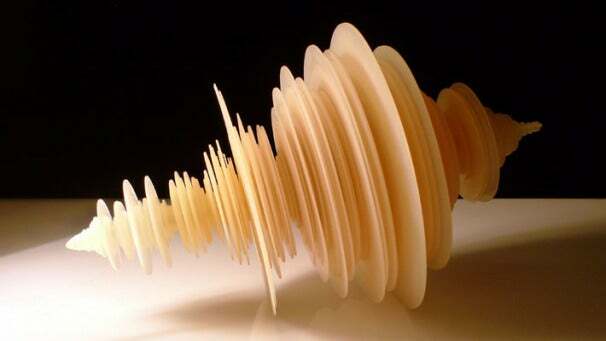 In an attempt to extract art and beauty out of that terrible event, British artist Luke Jerram has created a 3D-printed sculpture of the seismogram (the read-out from a seismometer) from that earthquake. Called the "Tōhoku Japanese Earthquake Sculpture," the piece is 11 inches long by seven inches wide and is made of frosted beige-yellow rings. Jerram constructed the piece by taking the design from a nine minute span of seismometer data from the earthquake and creating a 3D image with a computer aided design program. Then he printed the design using a rapid prototyping machine. What’s really striking about the piece is how it depicts the earthquake’s force. The largest rings correspond with the most violent vibrations from the earthquake and it really hits home how massive and strong the earthquake was. A seismograph doesn’t always register with me--sometimes I just see a bunch of lines that lack meaning. But seeing this sculpture really helped me understand the amount of force Japan took on March 11. It is also a great example of the strides in that have been made in 3D printing, bringing a whole new medium to the art world. The piece will be on display in London at the Jerwood Space in the “Terra” Exhibit starting this month. Luke also has some additional photos and video on his site. According to his website, Luke also hopes to recreate this sculpture in glass in the near future. Luke has also made some really fascinating sculptures of microbiology and a piece depicting the sound of the atomic bomb dropped on Hiroshima, both of which are worth checking out.